Police in Venice have told Ken Howard to stop painting in St Mark's Square in Venice - where he has a home and has painted for the last 60 years! Here are a couple of newspaper articles which cover what happened. The artist, a former president of the New English Art Club and a professor of perspective at the Royal Academy, told them he had used the same spot for decades but they remained unmoved.“I first came to Venice in 1958 and I’ve never had a problem,” Prof Howard told The Telegraph.“But of all of a sudden they’ve brought in new rules which say you have to have a permit. It’s a bit daft.”On Tuesday he duly went to the municipal office which issues the permits, only to find that it was closed. Italian police give Troubles artist brush-off | Belfast Telegraph - which highlights the fact that Ken served as the Imperial War Museum's official British artist in Ireland between 1973 and 1979 - during "the Troubles"
An artist known for his work in Northern Ireland during the Troubles has criticised "overzealous" police in Venice after being removed from the city's famous St Mark's Square. Posted by Making A Mark on Friday, August 31, 2018 0 comments Who's linking to this post? 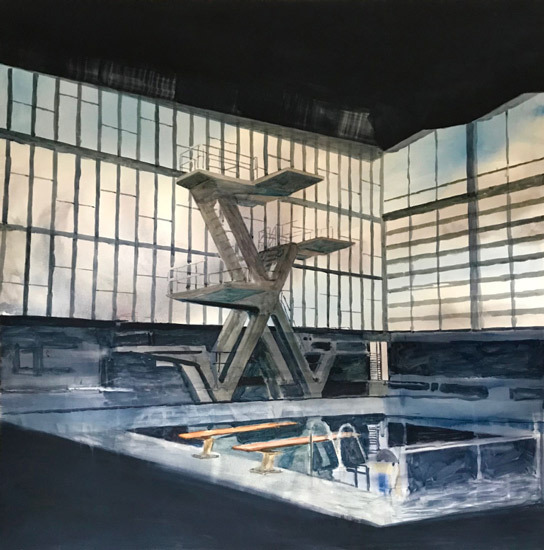 The exhibition takes place at the Mall Galleries next month - but is not on for long, so you need to make sure you've made a date in your diary if you want to get to see it. The exhibition dates are 18 – 23 September 2018 and the exhibition is open every day from 10am to 5pm. Admission is free. You can find my call for entries blog post here Sunday Times Watercolour Competition 2018 - Call for Entries. However on the basis of compiling this post, after last years' prizewinner debacle, I think the STWC may have turned a corner! Thank goodness we are back to having a 'proper' watercolour painting - that looks like a watercolour painting - winning the first prize. 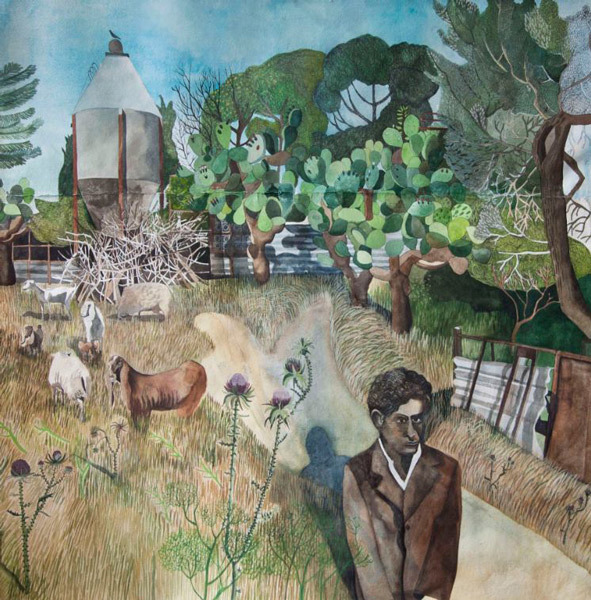 Second Prize (£3,000) was won by Michael Chance for 'Growth of the Soil'. It's an intriguing painting which reminds me of some artwork from the Far East. I'm wondering what impact the gum arabic and honey have had on the watercolour and ink. making a a success rate for selected works of slightly in excess of 6% of those submitted. You can see the panel of leading figures from the art world at the end of this post. I've researched the previous exhibiting history of those selected in the context of the competition (under its various names over the years) and have highlighted the history of exhibiting for specific artists. I'm particularly taken with how many artists are NEW to the exhibition this year - which I think (before seeing the exhibition) can only be a good thing. I'll let you have my further thoughts on this when I've seen the exhibition! This year, the ONLY people who have links (in their name) are the artists who have their own website. However entries may contain bio details from other sites. What's sad for me is that those without a website probably won't ever know they got the opportunity to be profiled in this post. Previous STWC record in this competition indicated in blue italics. Posted by Making A Mark on Thursday, August 30, 2018 0 comments Who's linking to this post? 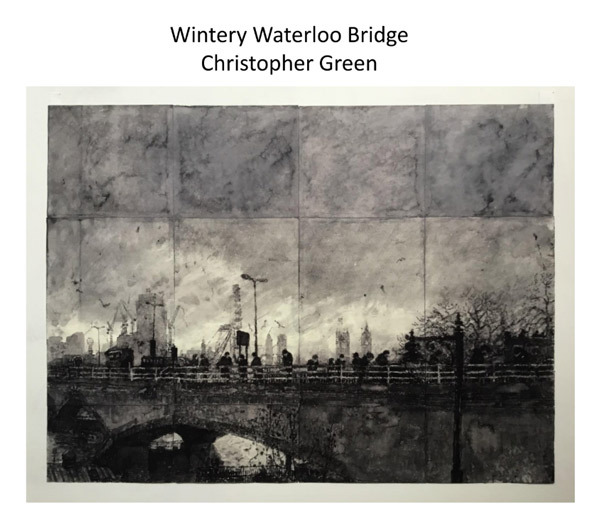 Green and Stone - the renowned and extremely popular supplier of art materials - is on the move from its current home at 251 Kings Road in Chelsea. It has to move quickly and hopes to be in its new home by October - and you can help! .....over the years, due to our fiercely loyal customers we have remained; and I am proud to say we are the longest running shop in Kings Road. 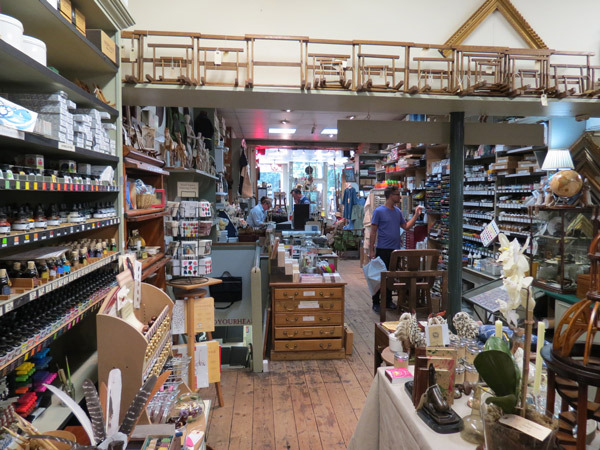 We have kept Green and Stone exactly as it should be; a creative hub of information for the artistic and with an eclectic mix of curios. It serves as a peaceful escape from London’s modern revolt. However, the building has been suffering from some serious structural problems and has experienced repetitive flooding in the basement. To remain in the same building has its perks. We are a landmark destination; the black cabs know where to find us if you can’t. Our nostalgic shop front suspends you in a time now past and we can be relied upon as a location for a meeting place as we have been here for 85 years; indeed, Green and Stone is an institution. However, as with anything old, 259 Kings Road has its downfalls too. Without the TLC the building needed our dear shop has started to shake its head in protest and sent floods of biblical proportions through the basement; more than once, I hasten to add. I believe, after 85 years of trading here at 259 Kings Road, this old gal wants an early retirement. This day would always come, but we were not expecting it quite so soon. WE HAVE SOME PRETTY IMPORTANT NEWS. Posted by Making A Mark on Wednesday, August 29, 2018 0 comments Who's linking to this post? Lucian Freud painted plants and gardens as well as people and animals. I was reminded of this last Friday when I saw Two Plants at Tate Britain. Today I decided to review the paintings of plants and gardens by Lucian Freud as I'd never looked at them all. quotes by people - including Freud himself - about his paintings of plants and why he did them. In between are my photos of the above painting after I gave it my usual nose to canvas inspection..... I found the way in which he applied paint to very interesting. All we need now is an exhibition dedicated to his paintings of plants and trees. There's certainly a lot of paintings to pick from! 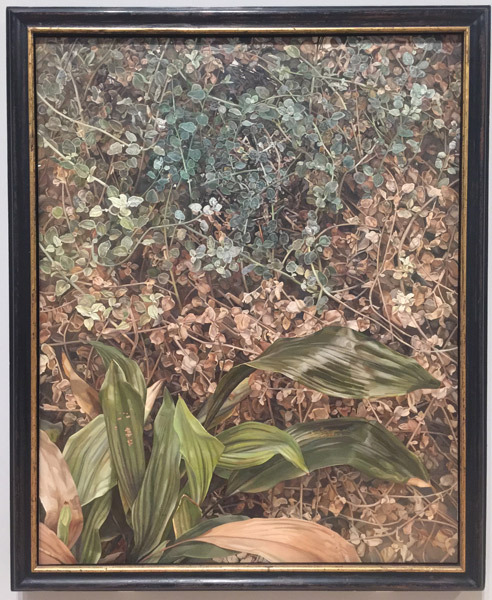 You can see his plant paintings in The Lucian Freud Archive. either Bridgeman Images which represent his work for licensing purposes. 1951 - Balcony Still Life - Looks like a very dry neglected yucca; maybe the plant from the Painter's Room putting in a reappearance? For Freud, Jamaica's relaxed and vibrant island culture represented a welcome escape from the turmoil surrounding his private life back in London. 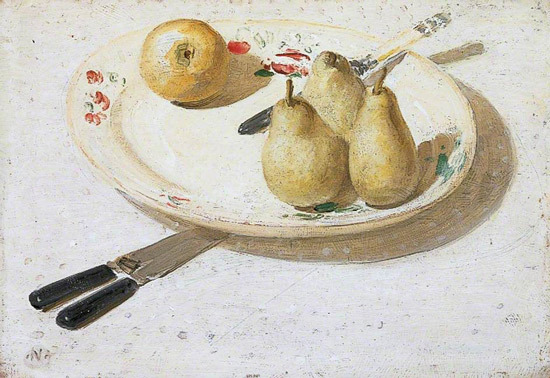 This was reflected in the two paintings that he produced whilst he was there, Bananas(Collection of Southampton City Art Gallery) and Plants in Jamaica; both of which were conspicuously devoid of any human presence. "I noticed I switched away from people when my life was under particular strain," recalled Freud. "I preferred working in complete isolation. Not using people is like taking a deep breath of fresh air" (the artist cited in: Exhibition Catalogue, Venice, Museo Correr, Lucian Freud, 2005, p. 35). The tropical beauty of the verdant Caribbean landscape provided Freud with a fresh and fertile source of inspiration for his painting. Perhaps more importantly, the painting en plein air that it required brought to his work an unprecedented immediacy and technical vitality that Freud developed over the course of the next ten years into an altogether more fluid approach to both subject and technique. Posted by Making A Mark on Sunday, August 26, 2018 0 comments Who's linking to this post? I went to the All Too Human - Bacon Freud and a Century of Painting Life exhibition at Tate Britain yesterday. The Spring and Summer have been full of other activities - and sunshine - and I suddenly realised the exhibition closes on Monday! All Too Human explores how artists in Britain have stretched the possibilities of paint in order to capture life around them. The exhibition spans a century of art making, from the early twentieth century through to contemporary developments. 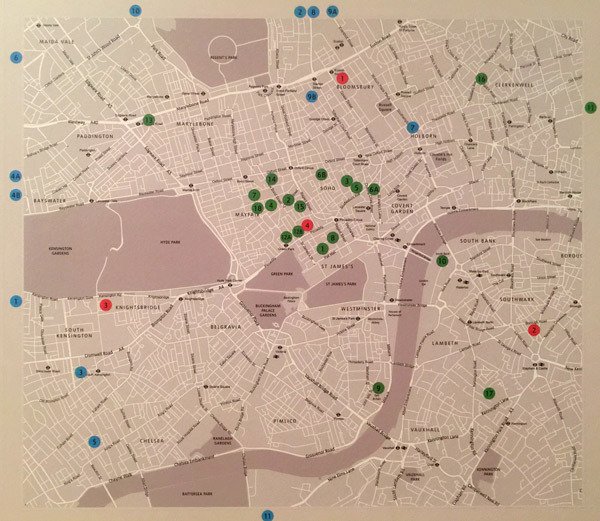 London forms the backdrop, where most of the artists lived, studied and exhibited. 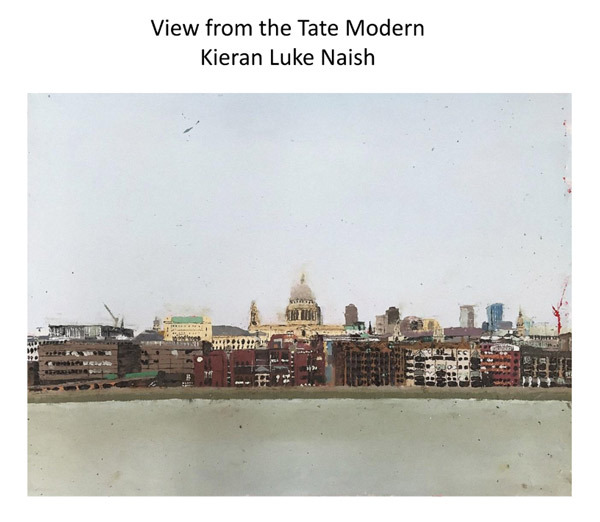 I'm not going to comment on the art as everybody has their own perspective and the reviewers from the newspapers have given it a thorough going over (see links to their reviews at the end). Instead I'm going to comment on something that struck me this morning when reviewing the names of who was in the exhibition - and who was not. it has very few women painters. Notably Paula Rego gets a room to herself and there is a large painting by Jenny Saville - but other female painters are less notable than the chaps. there's an effort at diversity (as in 'tackle the checklist') - in terms of ethnicity - but it's not very persuasive. It's very definitely an exhibition of paintings by people with very diverse backgrounds - although very little is made of this. 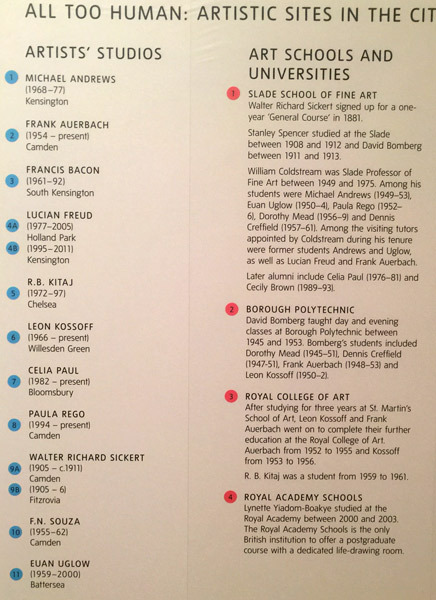 It hadn't really occurred to me before this exhibition just how diverse "British painters" in the 20th century were. 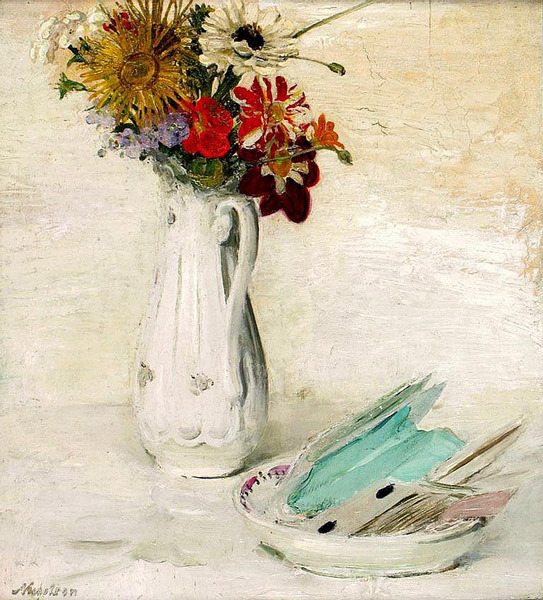 The art (mostly paintings) are by artists who had some sort of association with London - with some being members of the so-called "School of London" - and very many underline the diversity of nationalities in the capital - and in the field of painting in the 20th century. Posted by Making A Mark on Saturday, August 25, 2018 0 comments Who's linking to this post? 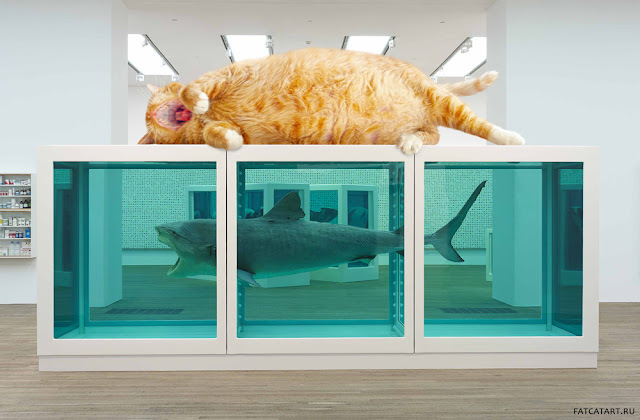 I happened on Fat Cat Art again recently - and decided to try and understand a bit more about how a very "fat ginger cat with attitude" could contribute to derivations of some serious art. The fat ginge is called Zarathrusta and is owned by Svetlana Petrova - who lives in St. Petersburg. She always had cats - and involved them in her creative projects. However Zarathrusta is really her mother's cat and she inherited him after her mother died. 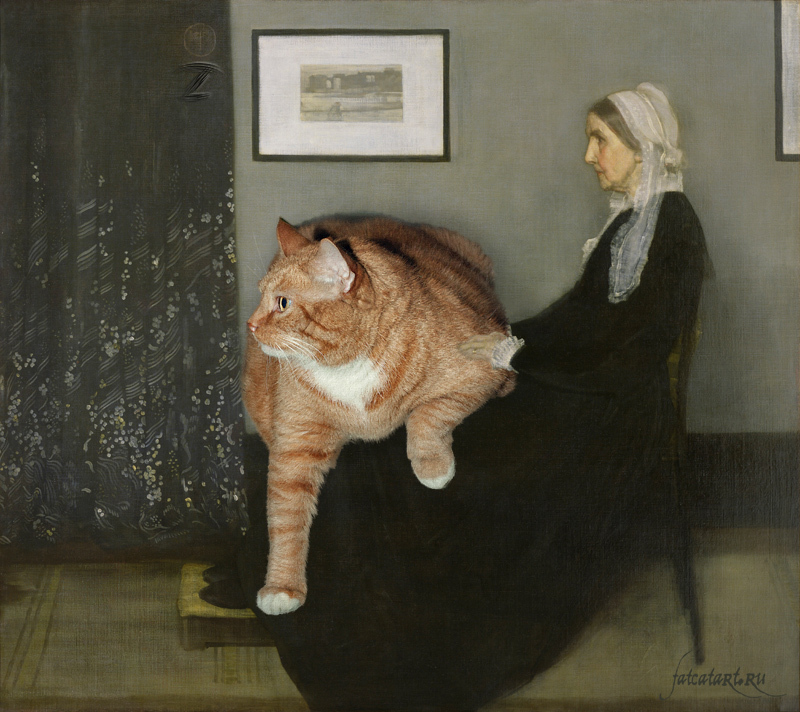 We, Zarathustra the Cat, enjoy Ourselves as the first cat contemporary artist, working in fields of performance and appropriation art. 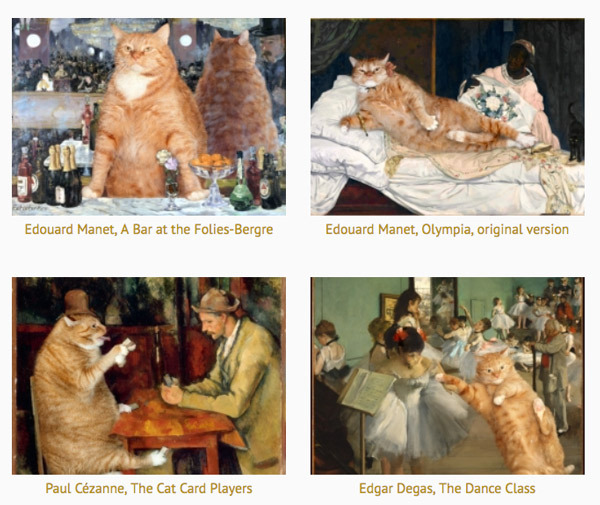 The website was launched in 2011 and since then he has been digitally integrated into rather a large number of famous paintings - in an amazing range of styles and period of art - and his artwork has gone viral around the world. I'm a particular fan of some of the changed titles of the paintings. There's some thought gone into these! text is created to go with the picture - by his bilingual author/artist mother. In fact a small cottage industry in St. Petersburg runs off the stretches and contortions of Zarathrusta and the digital wizardry of Svetlana. Posted by Making A Mark on Thursday, August 23, 2018 0 comments Who's linking to this post? I sounded off about the awful Pony Painting Parties on Monday on my Facebook Page - which seems to have contributed a little to getting the word out that these need to be stopped. The 2006 Animal Welfare Act says that owners have a positive duty of care towards their animals and a responsibility to prevent the animal from becoming distressed. Animals have ways of communicating distress - horses show stress signs through swishing, flared nostrils, raised tail, sweating and a raised heartbeat. These subtle signals are not obvious to families/children and could even be ignored by organisers who are prioritising profits. showing respect for animals who are not in a position to say 'No' (remind you of anything?). how come we can have laws and nothing is done about their implementation? The good news is that the petition is now up to nearly 160,000 signatures (from about c.25,000 signatures on Monday when I signed). I'm really not surprised given some of the comments from those who read my post on Monday. This is so sad that people think this is fun. I doubt it’s fun for the pony who has no choice in the matter. The UK really needs tougher animal laws on all levels ! that is awful, what a way to teach children how to treat and respect animals. I have horses, and there's no way anyone is getting near them with paint. This is just stupidity, and no respect for the animal, and apparently no desire to actually learn something about horses. In other hands it can escalate to abuse - there was a case at an auction place where a poor pony was dropped off, after being used as a paint gun target, hundreds of shots taken at him. Someone was eventually charged. O fer heaven's sake. I try so hard to teach children to RESPECT and VALUE animals - what lamebrain thought this was OK? Interestingly the number of signatures to dare way exceeds some of those petitions already debated by Parliament eg Hold a referendum on the final Brexit deal! 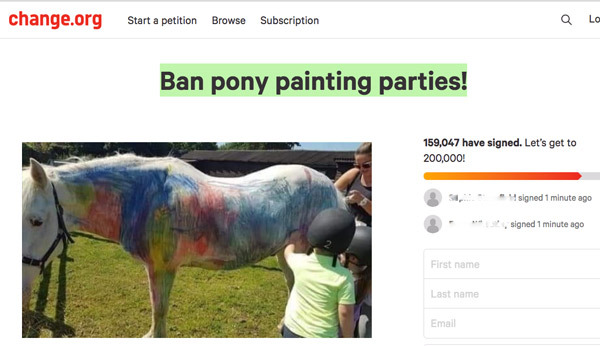 This is the link to the Petition to Ban Pony Painting Parties if you'd like to sign as well. ...and this one will be getting a debate in Parliament. BUT - and this is important - the actions of politicians will depend on how many people sign it before it gets to the debate! there are lots of art teachers out there who are very happy to give their kids painting lessons - without disrespecting dumb animals! The Guardian - Pony painting parties: is it really OK to let kids daub paint on live animals? Posted by Making A Mark on Wednesday, August 22, 2018 0 comments Who's linking to this post? So I took a photograph of the label of one and did a little bit of research. 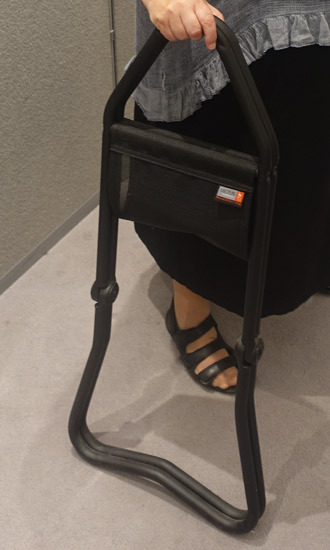 it's also very comfortable - and has even won awards. STOCKHOLM II has received the “Excellent Swedish Design Award” and the “Red Dot Design Award, The Best of the Best”. 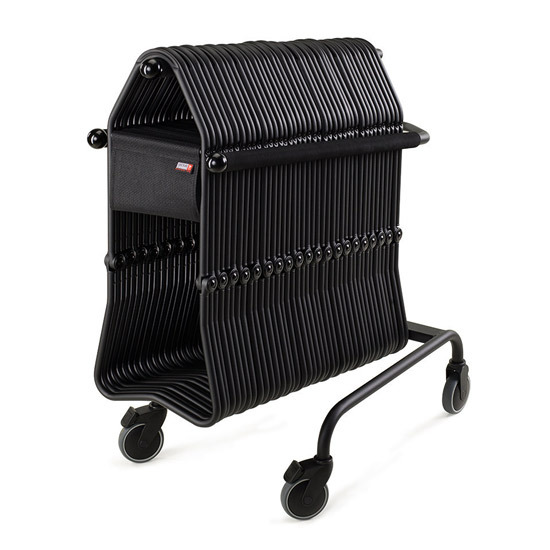 Plus it comes in a variety of colours. There are even variations - the New York comes with a wider seat and the Chicago one is somewhat lower to the ground. Plus there's even one for kids! However if you're thinking it might be nice to own one of your own, prepare for a sharp intake of breath - because they are NOT cheap. 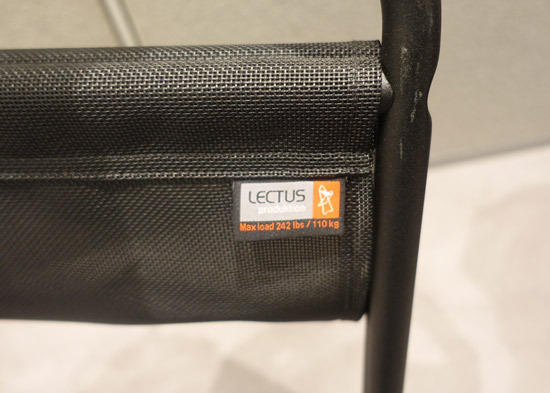 One of these very efficient and effective stools will set you back about £100. I shall look at them in future with a new found respect! Posted by Making A Mark on Tuesday, August 21, 2018 0 comments Who's linking to this post? This is an overview of the Call for Entries for the second year of the £10,000 Evening Standard Art Prize in association with Hiscox. The theme of The Evening Standard Art Prize is ‘progress’ and aims to inspire artists around the UK to create original works. Below is my overview of the Call for Entries. 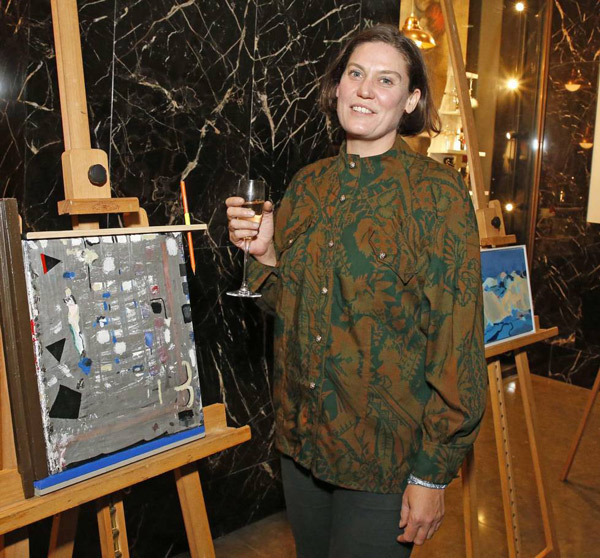 The winner of the First Evening Standard Art Prize in 2017 was painter Helen A Pritchard (below) and or her abstract painting ‘To Make a Sculpture’. She is a graduate of both the University of East London and the Royal College of Art. 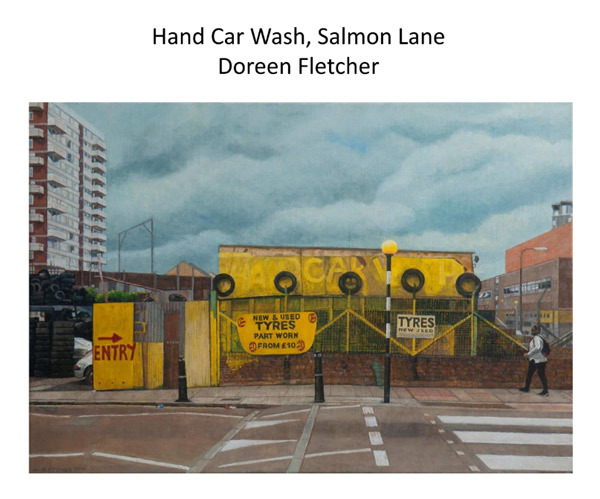 The overview below is interspersed with images of some of the works which made it though to the Shortlist last year - as in these were the ones I liked! There is one prize which comprises three elements - all of which on their own are worth having! Hiscox Fine Art Insurance up to a maximum premium of £2,500 for one year (subject to eligibility; and the artist must reside within the UK). The winning entry will be the favourite entry selected by the judging panel from all valid entries received. NEW Olivia Laing - a British writer, novelist and cultural critic. first, has the artist successfully reflected the brief? Second, have they followed the rules – which are very simple? Paintings, drawings and sketches are all accepted, so long as they’re no larger than size A0 (841 x 1189 mm) … and that’s pretty much it. Only artists aged 18 years or over and resident in the UK can enter. You can only submit one piece of artwork. - it can be a painting, drawing or sketch no bigger than A0. The deadline for entries is 23:59 on Sunday 30 September 2018.
three images of the work from different angles (not to exceed 14 MB) . The Evening Standard also has a standard set of rules relating to their competitions / promotions - and you need to comply with these. For further information, please write to Customer Care, Evening Standard Limited, Northcliffe House, 2 Derry Street, London, W8. Details of "what happens next" will be sent to those artists whose digital entries are long listed. I'm guessing you will hear within a few days of the deadline for entries - which means if it needs to be framed you need to plan ahead - before you hear the result! artists will be required to sign a waiver before their work can be displayed for final judging. 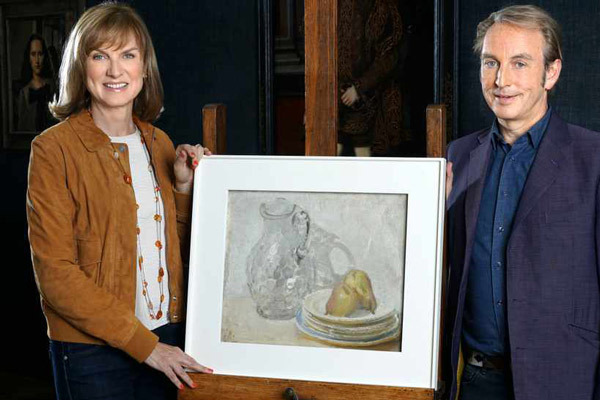 Hiscox is solely responsible for the Fine Art Insurance prize. You can read more art competitions (past and present) in my Page dedicated to Major Art Competitions in the UK. Most have a minimum of £10,000 as a prize. Posted by Making A Mark on Monday, August 20, 2018 0 comments Who's linking to this post? 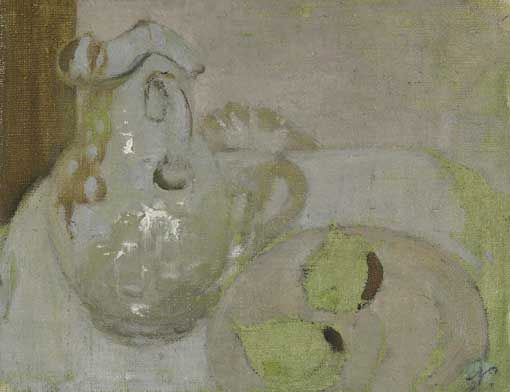 the relative credentials of the two authors of the two very different catalogue raisonnes for William Nicholson - one that included the painting of the Glass Jug (in handwriting) and one which did not. The two authors are Lillian Browse - author of William Nicholson - published by R. Hart-Davis, 1956. The glass jug was included in her own handwriting at the back of her own personal copy of her book. Lilian Browse was extremely well known. She was referred to as the Queen of Cork Street (the road in London where most of the prestigious art galleries can be found). first Roland, Browse and Delbanco - which dealt in Old Masters but specialised in modern works in which she had become expert. her entry to the art world involved working as the equivalent of an intern, without pay, for Harold Leger of the well-known Leger Galleries in Bond Street. She was rapidly promoted from intern to secretary to manager. She was involved in organising exhibitions by William Scott, Stanley Spencer, Charles Ginner, Jack Yeats, Edward Ardizzone and 'many more up and coming artists' of that time. 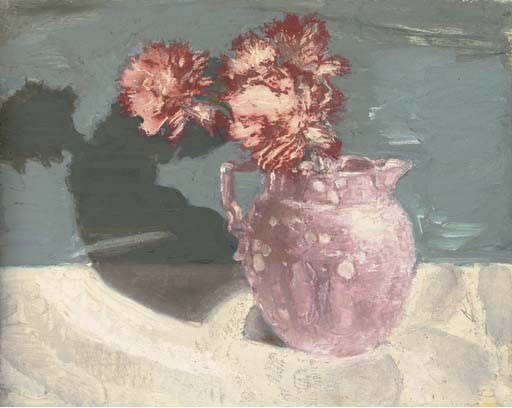 she helped to revive interest in such neglected figures as Rodin, Degas, William Nicholson, Augustus John and Walter Sickert, of whom she wrote a biography in 1960. 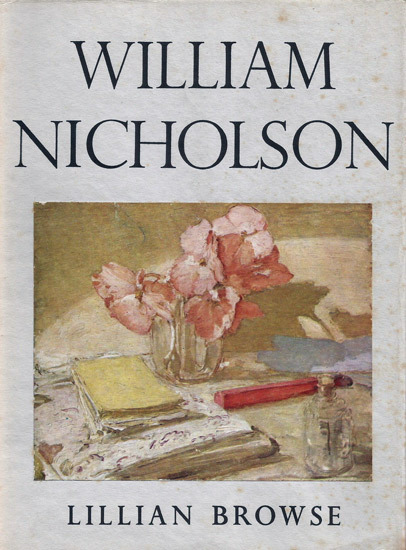 But, of all the painters she came to know, she reminisced in 1985, ‘the man I really loved was William Nicholson.’ The memory of his ‘delightful courtesy and charm’ during their first meeting at his Apple Tree Studio in the 1930s left a lasting impression, and - despite the considerable difference in their age (34 years) - they became ‘devoted friends.’ She particularly admired this painting and the ‘controlled freedom’ of Nicholson’s paint handling, which she felt showed the touch ‘not of a virtuoso, but of a master. 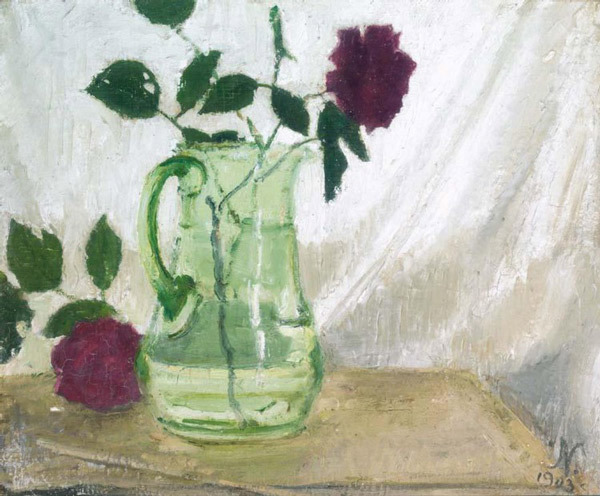 she opened Browse and Darby at the same premises in Cork Street in 1977.
in 1983, she gave the greater part of her own collection of late 19th and early 20th-century paintings, drawings and sculpture to the Courtauld Institute. in 1999, her autobiography was published titled "Duchess of Cork Street" - a nickname given to her by her neighbour Rex Nan Kivell, the founder of the Redfern Galley. she also wore legendary hats! She died, agee 99 in 2005. 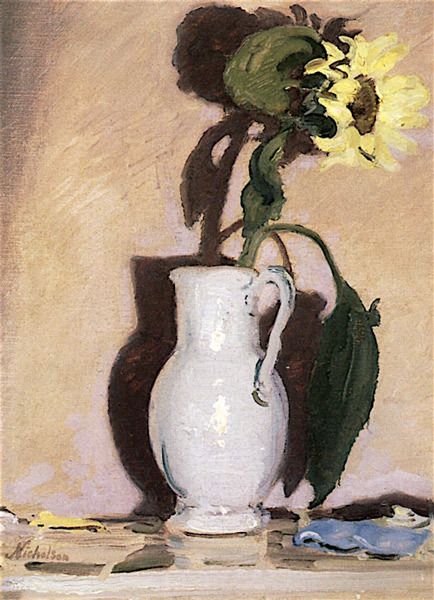 In short, this is a person who knew William Nicholson very well, probably visited his studio more than once and, after his death, wrote a book about him. The glass jug was not mentioned in the book - but was later added in her own handwriting to the end of her copy of her book. The weakness in the argument for her being the greater authority is that she never got the opportunity to check any of the paintings she did not know at the time of writing the book with the artist himself. I can find no information about this woman. Absolutely and precisely nothing. Nada. I'd just note that I have NEVER ever found such a lack of information about an author of note online - particularly when that individual is supposed to be the acknowledged expert on an artist. The reviews of her book indicate that people have a high regard for her academic approach and the thorough nature of her catalogue. We are used to catalogue raisonnes having a selection of full page reproductions but with most images, by the limitations of space, reduced to a small size, often many to a page. 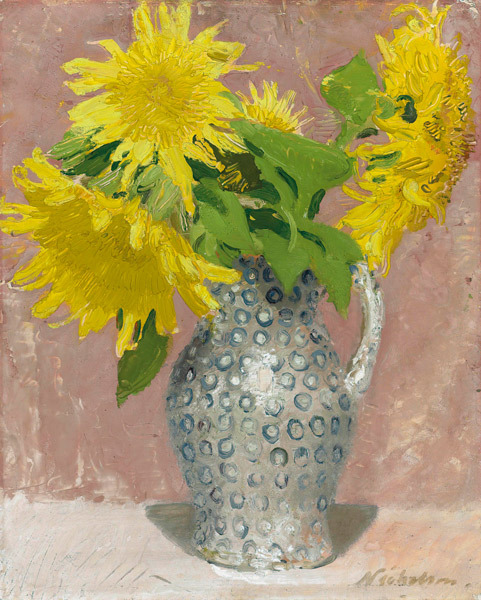 I have several particularly good ones, Picasso's graphic works and Fairfield Porter. It is a trade off we understand for the complete works in one volume. However, the sheer waste of white space in this book is diabolical. If this book has given itself the luxury of spreading images out one or two to a page, why are they reproduced so small when the accompanying text often leaves half the page completely empty. You just know some graphic designer has entirely priveleged his/her layout over the actual content, or the editors have been so preoccupied about including the minutest details of provenance that their personal familiarity with the actual paintings, or good reproductions of them, has blinded them to the inadequacy of the reproductions here. Many paintings have been reproduced better in other books on Nicholson and not just for scale. Many look too desaturated. 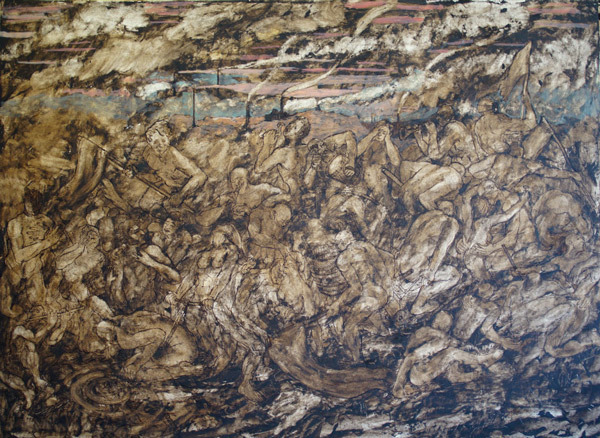 It is a feature of his work that very subtle tonal and colour relationships radiate slowly from the painting. A good reproduction should seek to capture something of this sensation before the work and not take an 'honest' snap that bears no relation to our perception. Some are reproduced well but the quality is very inconsistent. 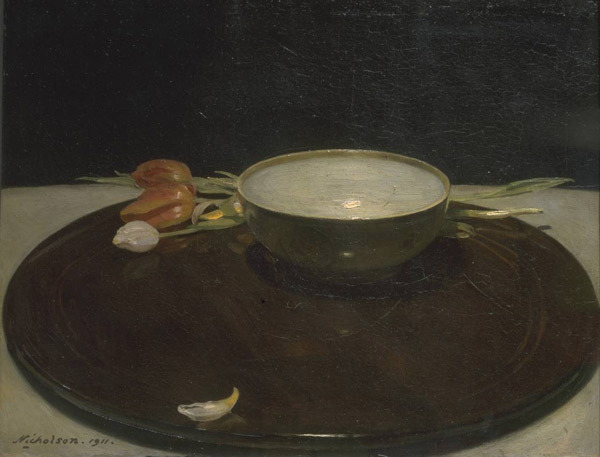 I should explain this section by saying my initial reaction when viewing the painting in advance of the programme was that it would be found that the painting was not by Nicholson. However my "evidence" was entirely to do with "eye" and nothing whatsoever to do with science. My rationale was entirely to do with the draughtsmanship relating to the curves of the jug. 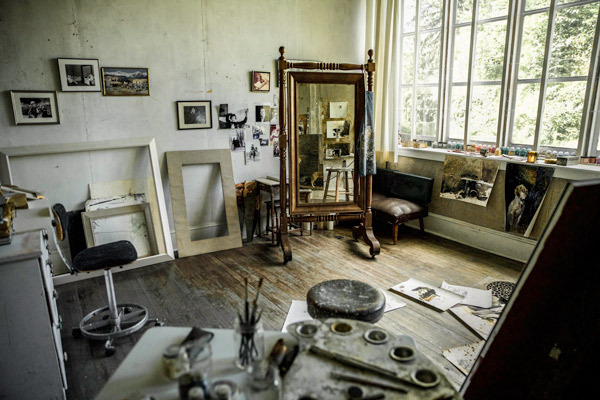 However that only means he may have once painted freesias, put the board in his box and then subsequently scraped/wiped it and had the board in his studio for a while. 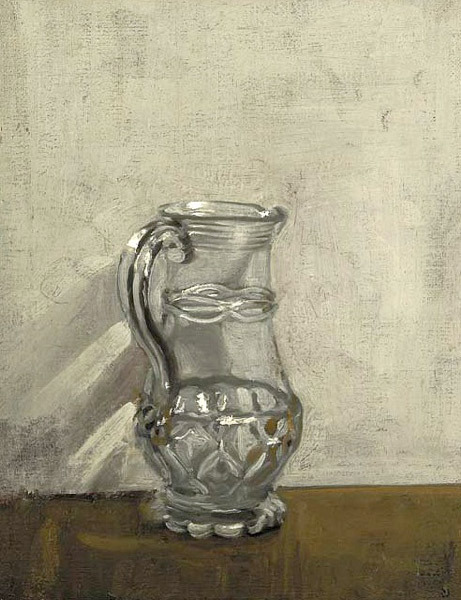 It did not establish that the painting of the jug was by Nicholson. 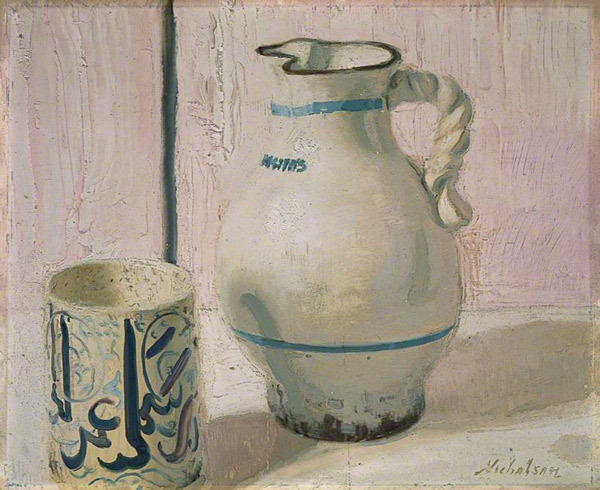 I decided to look at other paintings of jugs by Nicholson - and work on the basis that although a painter may change their style over time, there are some things that rarely change. 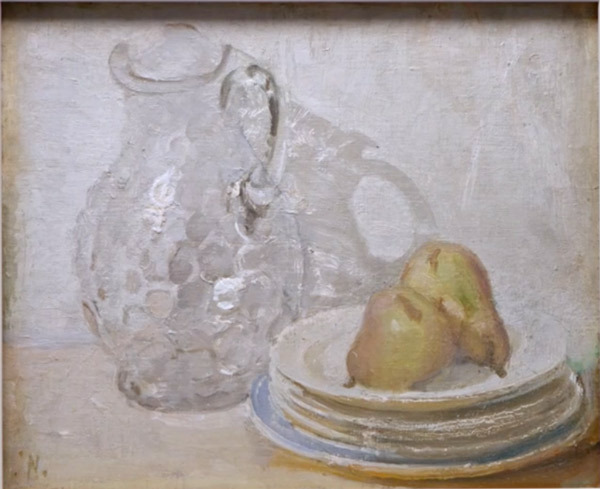 So below we have the painting of the glass jug and some other paintings by Nicholson. First the painting in question. I agree with Patricia Read that the drawing of the jug handle and the ellipse of the mouth of the vase are both wrong. Evidence of his other paintings strongly suggests this is not something he would do - even when he is painting in a less precise style. 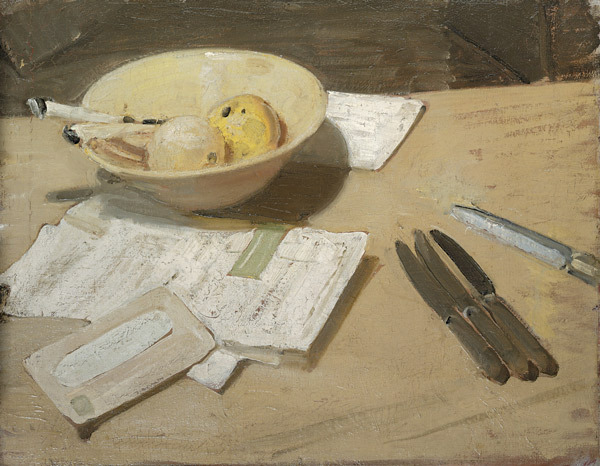 by William Nicholson when on a visit to Arthur Kay. Though dated 1903, the subject matter, handling and palate of Red Roses clearly places it towards the end of Nicholson's painting career. The description in Browse of Red Roses in Glass Jug undoubtedly refers to the present work but the dating remains incongruous. No clear explanation exists for the signature and date given by the artist. and another - he really seemed to like looking at a jug from the most difficult angle. The year is comparable if the train timetable is to be believed. You may have noticed by now that he paints ellipses which are pretty near perfect - and his handles are very fine. UPDATE: I was sent this photo of a bubble glass jug - the lipe of which seems to make more sense of the Canadian painting. 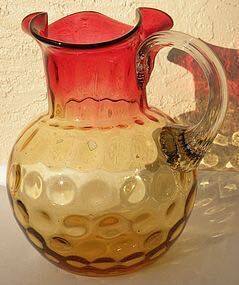 I've reviewed "glass bubble jug" as a query on Google Images - and there are an awful lot of them - and some have the curious wavy top lip. Posted by Making A Mark on Saturday, August 18, 2018 0 comments Who's linking to this post? Here's the extended trailer for the new documentary film about Andrew Wyeth. It was originally planned for a 2012 release - but it's now going to be next month! WYETH - Extended Trailer from FreshFly on Vimeo. 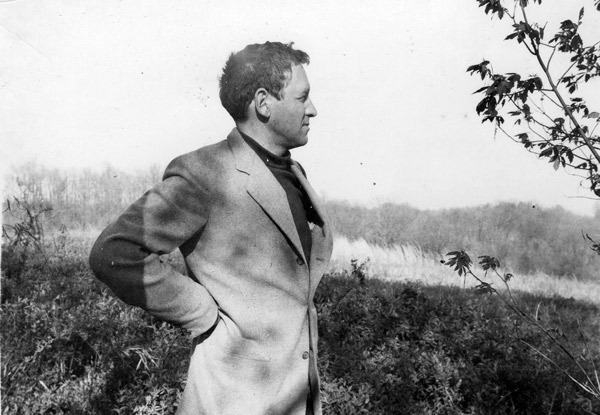 WYETH is a documentary film telling the story of one of America’s most popular, but least understood, artists. 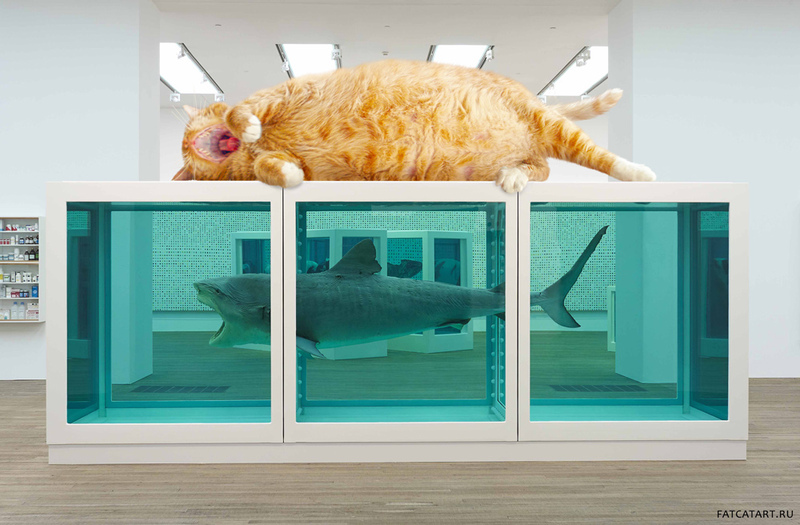 While his exhibitions routinely broke attendance records, art world critics continually assaulted his work. 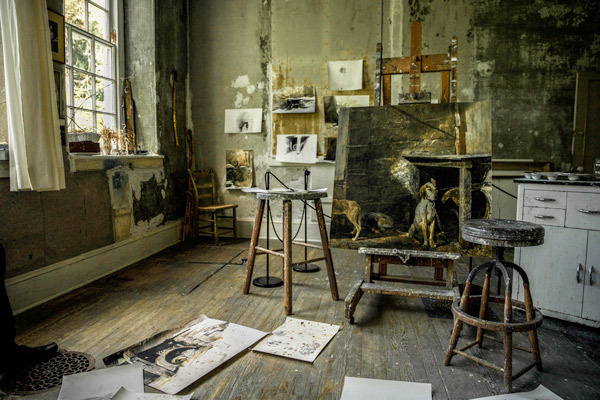 Through unprecedented access to Wyeth family members, archival materials, and his work, WYETH presents the most complete portrait of the artist ever - bearing witness to a legacy just at the moment it is evolving. reviews the sources of the emotional undercurrents and exposes the influences on his creativity. It has its own website https://www.andrewwyethmovie.com/ and it also has the support of the Andrew Wyeth Office and Wyeth knew it was planned before he died. this is an expertly made, exhaustively researched documentary with a suitably painterly feel in its widescreen visuals. There is compositional beauty in cinematographer Phil Bradshaw's textured images, but also the harshness and darkness that were quintessential elements of Wyeth's art. Given the ongoing rediscovery and deeper appreciation of his work that has continued since his death in 2009, the film should find a receptive audience at festivals and art forums. The Andrew Wyeth MovieCurrently titled “Wyeth”, the movie line was written in 2008 and personally approved by Andrew Wyeth himself, who cited a desire for the screenwriter “not to take it easy on him at all.” The project not only has Andrew’s personal blessing, but also the approval of the Wyeth family, who have confirmed that the events in the screenplay are based on facts and actual events. Unfortunately, ninety-five year-old Andrew passed away in late 2009, before the film could be completed. PHILADELPHIA PREMIERE - WYETH will screen at the Kimmel Center on September 5, 2018. Click here for tickets. WYETH will be broadcast during PBS' American Masters on September 7, 2018. Check your local listings. WYETH is available for pre-order on DVD at Amazon and ShopPBS. No news yet of how it can be seen outside the USA. I do hope it's going to Netflix! Posted by Making A Mark on Thursday, August 16, 2018 0 comments Who's linking to this post?